©2012 Betsy Malloy Photography. Used by Permission. 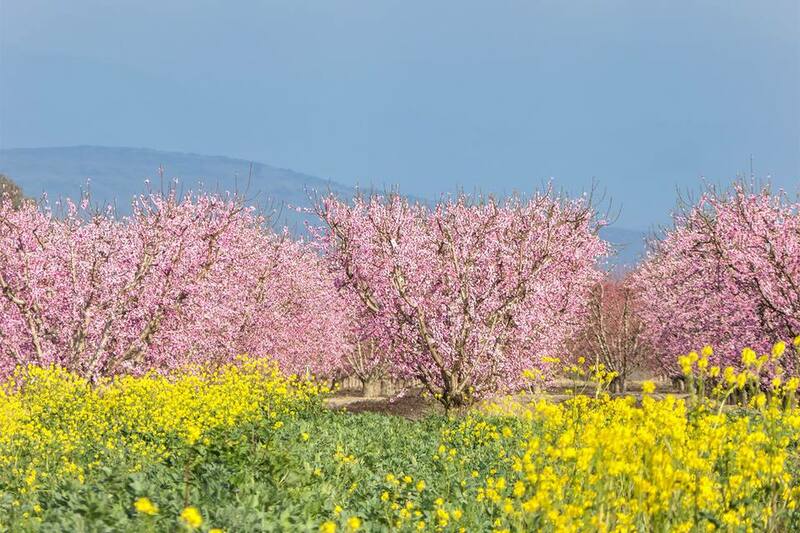 In the spring, The Fresno Blossom Trail takes you through the orchards of California's Central Valley. Drivers, bicyclists, and photographers alike are prone to say "Wow!" when they make the 62-mile loop drive. And it's no wonder. In spring, the orchards turn into dreamlike expanses of trees covered with pink and white blossoms so dense you can barely see the tree limbs they grow on. As the flowers wilt, they shower the ground, creating a carpet of petals so thick that it looks like snow. The scenic drive may look like a tourist attraction to you, but it's also an essential part of California's agricultural industry. The state is the country's top producer of peaches, and plums and similar fruits, along with almonds and citrus. Before all the luscious fruit ripens, the orchards put on the annual floral display. To get maximum enjoyment from your trip, you need to go at the right time. The bloom dates vary depending on temperature and rainfall, and the displays are more spectacular in some years than they are in others. In general, blossom season begins between mid-February and mid-March. Mark your calendar to start checking for blooms during that time. To find out when the blooms will peak this year use the Blossom Trail website. Every week, they post current photographs, and you can get a good idea of when the trees will be in full bloom from that. One of the most enchanting things about the Blossom Trail is the vast expanses of same-colored blossoms. Along the trail, the pink-flowering trees you see will produce peaches and nectarines. The white ones are plums, almonds, and apples. Local orange groves also bloom around the same time. The orange blossoms are smaller and harder to see among the trees' leaves. They may not look as spectacular, but there's something about them you shouldn't miss: lower your car windows to take in their perfume. You won't find a lot of formal stops along the Blossom Trail, but you can pull off the roadside in many places to enjoy the beauty, take photographs and smell the flowers. Many people like to get into the orchards to take photographs. If you do that, don't be one of those annoying people who ruin things for others. Instead, keep in mind that those gorgeous flowers are also part of the owner's income and be careful where you step. You won't find many places to eat along the trail, either, but you can bring along a picnic lunch. There's a nice little turn off next to the Kings River near Minkler that's a perfect picnic spot. From San Francisco, Sacramento or San Jose, you can see the Fresno Blossom Trail on a day trip. Allow several hours to drive the whole trail after you get off California Highway 99. While you're in Fresno, it's well worth a stop to see fruit trees growing in a very different setting at the Forestiere Underground Gardens. If you drive along the blossom trail in the summer, you'll find roadside produce stands where you can buy tree-ripened fruits. To get started: If you are traveling from the north, exit California Highway 99 at Jensen and follow the loop drive on the map. If you are coming from the south, exit California Highway 99 at Kingsburg. Signs are posted along the route to help you keep on track. Unfortunately, they're so cute people often steal them. As a result, you could miss a turn and end up lost. To make sure that doesn't happen to you, get a map. If you like to go old school with a paper map, stop at the Visitor's Center in Downtown Fresno (1180 E Shaw Ave #201) to pick one up. You can find a map online at the Fresno Blossom Trail website, but it's not to scale, and if you want to make a paper copy it may not print well enough that you can read the street names. Use this Google map to see the route instead.